Our NEW sliding 3/4 width in van pull tested rock and roll bed with rail system and quick removal mountings. The Smartbed Evolution R is the culmination of an extensive two year research and development programme driven by market demand for a more versatile Rock and Roll bed system. Here at Smartbeds we undertook the challenge to design our very own rail bed system. Complete with all the great features, quality and ease of use you’ve come to expect from the Smartbeds brand, the Evolution R system hits it out of the park and also includes our new “Evolux” upholstery for improved seating and sleeping comfort. 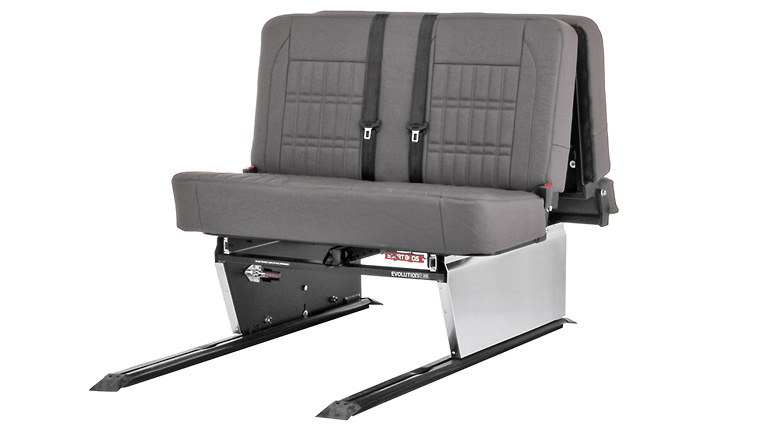 Roll and lock in the forward position and your passengers are close to the cab also allowing for ample boot space. Roll and lock to the rear when camping for maximum living area. The Smartbed Evolution R is the seating and sleeping system your conversion has been waiting for.